Today we honor the memory of Killian Shields. 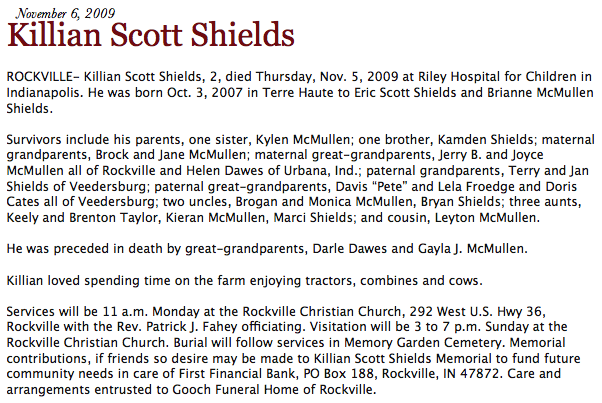 Killian was born on Oct 3, 2007 and went to be with Jesus November 5, 2009. His family holds two precious years of memories with this special guy. Please pray for his parents Brianne and Eric, his siblings and the rest of the Shields/McMullen family. As I asked our Sunday School class to be in special prayer for the family during this week, Brianne asked (and I don’t think she’d mind if I share) to list their family on the praise side as well. Through tears she spoke of how blessed she feels to have such a wonderful family, despite the heartache they’ve endured. As you pray for them, take a moment to thank God for wrapping His love around Brianne and helping her to see these blessings. The songs “There Will Be A Day” and “Blessings” are posted in honor of Killian. Amazing strength the family has! Will definitely send prayers and praise for them! Reblogged this on Embracing Grace.